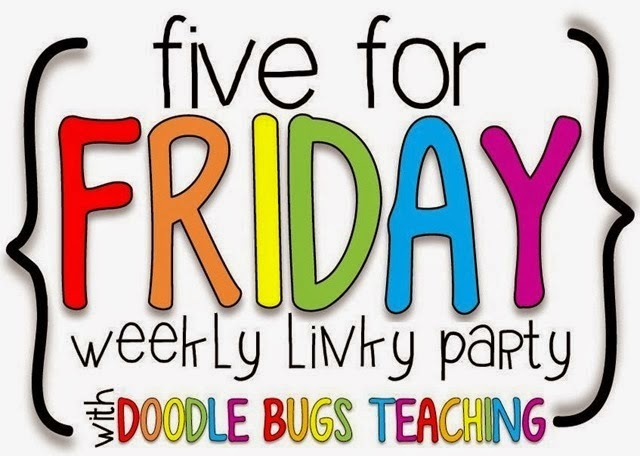 I'm linking up as I LOVE to do with Doodle Bugs Teaching for Five for Friday. This has been SOME WEEK! But I'm not going to tell you about it because as I write this Thursday night, there is still one MORE day to GO! When I finally wrap this week up I'm going to need some entertainment, and I'm thinking you might, too. So here are some great videos. I've been saving these favorites, but it is time to share. Some cool, some for the kids, some funny! Hope you enjoy! Get ready to Pin! 1. I'm starting off with something funny! There are lots of parodies of the song All About That Bass by Meghan Trainor, but this one is just for moms! Love it! I'm putting a link to it in my parent newsletter this week. 2. Here's one for the kids! The Beatles help them learn the words yes, no, stop, go... This Beatles fan loves it. Totally worth adding to your classroom Pinterest Board... You DO know that one of the best ways to collect videos for the classroom is by pinning them, right? Then with just a click to your board you can watch 'em. Simple. 3. This is Amazing and Delightful! Irish kids singing and performing When I'm Gone in Irish. I thought about saving this one for you until St. Patrick's Day, but couldn't wait. You can save it until then to show your kids, if you like. Who knew plastic cups were musical instruments... would be fun to introduce that idea to the kiddos! 4. This is Hysterical! I laughed so hard. I have two younger, identical twin brothers and when they were growing up, O.M.G. the trouble they would get into. What one didn't think of, the other one did. Naughty, naughty. I think they are the reason I went into teaching... if I could survive being the big sister through the shenanigans of those two, I could handle anything a class could throw at me. Now this guy and his friend are NOT my brothers. But this IS about being naughty, and if my two had thought of it, this COULD be a RobbieDave story. It makes me miss them way out in Colorado. Enjoy this chuckle! 5. I bet you wouldn't think that a kindergarten teacher from the Midwest would have an ounce of interest in the trends of NYC, but truth be known, I love The Big Apple, and I do have a couple ounces of fashion interest... remember I'm the one with the Hello Kitty shoes, the red fringe cowboy boots, and the monkey hat. Fashion statements, every one. Ever since I was little, NYC held some big fascination for me. My first trip there found me moving in for the summer while attending Bank Street College. I remember walking On Broadway on the upper west side humming the tune and thinking I had really arrived. Upon graduating, and before kids came on the scene, we considered taking up residence. I still like to keep an eye on the city. Watch what's happening in New York and you'll know all the trends. Whether it's animal hats, particular prints, or the latest accessory, if people are wearing it on the street there, you'll see it on the street of Small Town soon. 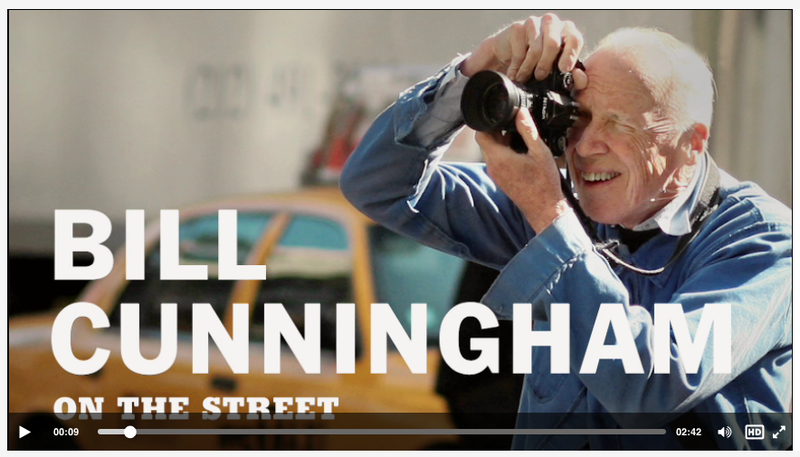 So I relish the almost weekly reports by Bill Cunningham. I love the man. I've never met him, of course, but he is just so full of personality and knowledge on his topic, how can anyone not enjoy him. He knows fashion like no one else. Who else has been watching fashion for well over half a century? I saw the documentary on him several years ago and he is a character, a true thread of the fabric that makes up the city, out on his bike in all sorts of weather, camera in hand, seeing people with that special eye. A weekend treat for me is to catch his New York Times piece, On the Street. It is a video slideshow with commentary that only Mr. Cunningham can do. Just marvelous! I love his snaps of ordinary people as they go about city life, and how he puts those pictures together. I'm on my way to NYC in a few weeks with my daughters for a long weekend of Christmas shopping and as I always do, I'm keeping an eye on what Mr. Cunningham is up to. I'd love to catch a glimpse of him at work. This Michigan gal will never be in front of his camera, but I'd sure love to see what he sees. For my last piece of entertainment, click on his picture below and catch three minutes of his stuff. Love ya, Bill! Scoot on back to Doodle Bugs and see what is going on with Kacey and the rest of your fellow teachers. And have a great weekend. I was thoroughly entertained! Thanks for a unique and fun Five for Friday!!! I loved every video. Thanks so much for sharing these! I especially like the singing and red cups- that was beautiful! Happy Thanksgiving! Great videos! Thanks so much for sharing. I really loved the "Just need some space". I so remember those days when my boys were younger, and even still once in a while now...lol.